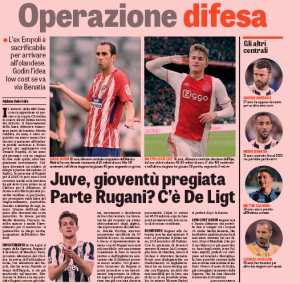 The Italian media won’t let go of Daniele Rugani to Chelsea, with the rumour picking up pace over the past week or so. With it being thought almost certain in Italy that Maurizio Sarri will soon be announced as the Premier League club’s new manager, Gazzetta dello Sport say he’s already ‘scheming’ in the market. Sarri worked well with Rugani at Empoli, when the player was on loan, and has kept an admiration for the Juventus defender. Gazzetta claim Chelsea have already made an initial offer of €30m, which was knocked back by Juventus. Chelsea are ready for a ‘new assault’ and the Italian newspaper believe €40m should be enough to make a Rugani sale possible. This reasoning is that Juventus are very keen on Ajax youngster Matthijs de Ligt but he’d cost them €45-50m and the Serie A champions would need a sale to make that possible. Rugani himself is said to look well on a move to England. Mehda Benatia’s future is also in doubt, with Gazzetta dello Sport saying Juventus could move for Diego Godin to replace him.